Another 257 Nigerians return from Libya – Royal Times of Nigeria. The National Emergency Management Agency, NEMA, yesterday received another 257 Nigerian voluntary returnees flown back from Libya. It could be recalled that hundreds of Nigerians stranded in Libya have returned to the country in 2017. The latest returnees arrived at the Murtala Muhammed International Airport, Lagos, in a chartered Airbus A330-200 flight with Registration number 5A- LAT at 9.15pm. They had been stranded in the course of their failed attempt to cross over to Europe through the volatile North African country. 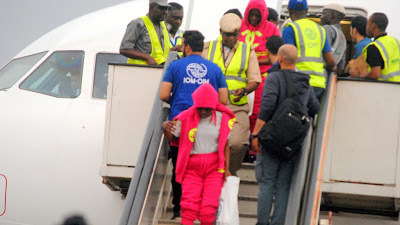 The returnees were assisted back to Nigeria by the International Organisation for Migration, IOM, while the Italian Government provided the aircraft. They were handed over to the Zonal Coordinator of NEMA Southwest, Suleiman Yakubu, who received them on behalf of federal government. The females among the returnees comprised 241 adults, two children and five infants while the male comprised four adults, four teenage boys and one infant.